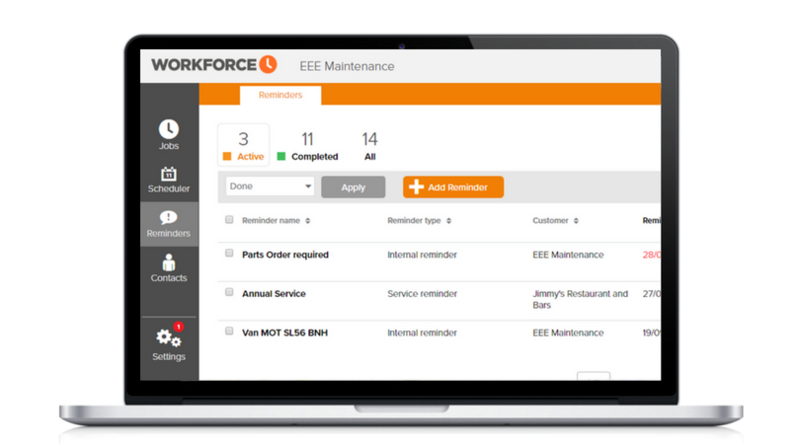 Workforce.FM is field service management software for all kinds of businesses using field workers. Our software is designed to make your job simple. We have added a reminders feature to help both office and field workers with daily tasks, as well as longer term deliverables. Everyone needs a friendly nudge every now and again. A huge part of effective job management, particularly in the field service industries, is keeping on top of regular tasks, no matter how small. Poor time management, whether internally or in terms of service delivery, can eventually lead to things piling up and put you further behind that you could’ve imagined. 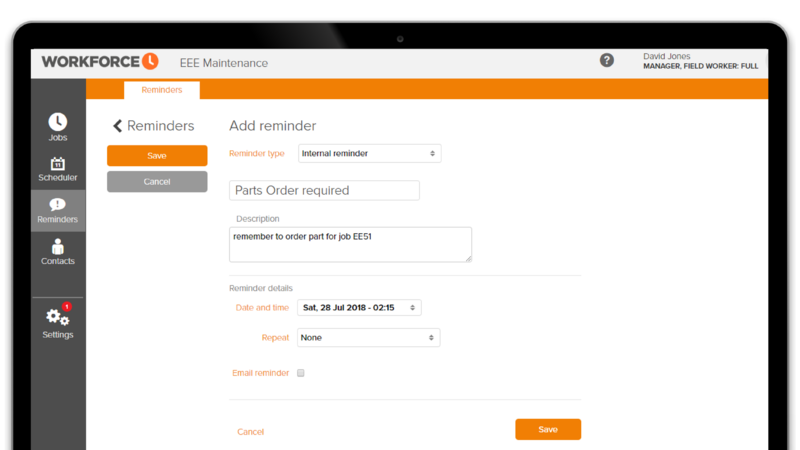 Workforce’s cloud-based field service management app gives you the ability to set reminders for both internal purposes, whether that’s ordering stationery or getting an MOT done on company vehicles, and external purposes, for instance letting a customer know that a service is due. In order to effectively deliver services to your customers, your office staff need to be on top of all their tasks, no matter what they are. 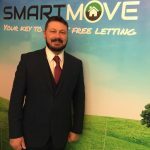 If an MOT expires on one of your vehicles and through simple human error, nobody books a new test, this could land your company in serious trouble as well as impede on your ability to provide the outstanding customer service you strive for. With Workforce, you have the ability to set up internal reminders, which will help keep administrative and management staff on top of things so that your field service can continue uninterrupted. Users will be able to clearly visualise how many reminders they have “active” in the reminders tab of the Workforce console or app. You can also set up regular reminders for tasks which need to be done on a rolling basis. Service reminders are a simple way of going above and beyond for your customers, letting them know that you’re on top of things. A retail client, for example, could easily forget the expiry date of their fire safety certificates and unwittingly leave them to expire. By sending your customers manual or automated reminders, you’re reassuring them that you have things under control and easily securing yourself more business with minimal effort. For both internal and service reminders, you can also set up automated email reminders. There are two status options available for reminders on Workforce: active or completed. Each reminder features a “done” button, which changes the status of the reminder once it has been clicked. This makes it incredibly easy to see what has or hasn’t been done, as well as notify office staff or management that a task has been completed at the click of a button. Keep your system ticking over nicely by marking off your completed tasks. You can also batch mark reminders as being completed, delete reminders in bulk and even export reminders to a spreadsheet for reporting purposes. 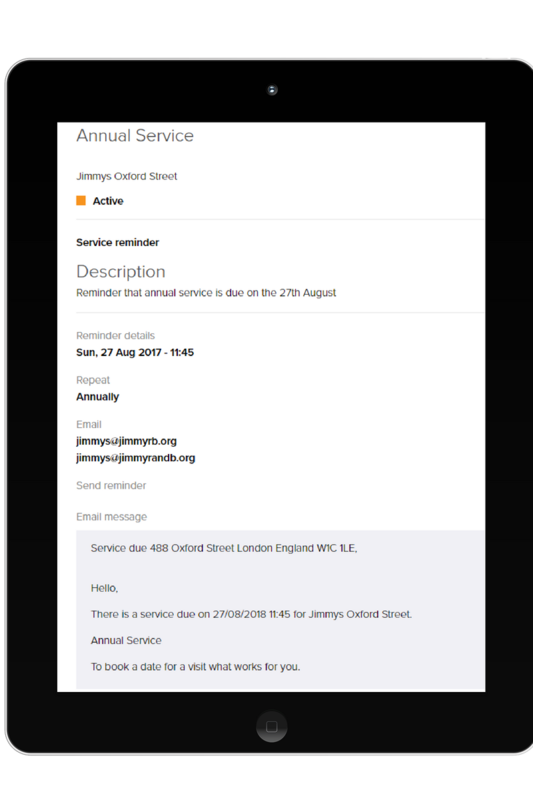 At Workforce, we’re so confident in our field service management app, including its reminders feature, that we offer a full, free and no obligation trial to all prospective customers. We provide complete access to Workforce for 14 days, giving you the option to subscribe at the end or close your account. This is a no auto-subscription trial, so you will not be asked for any payment detail during the 14-day period and if you do not sign up once it is over, your account will be automatically shut down.